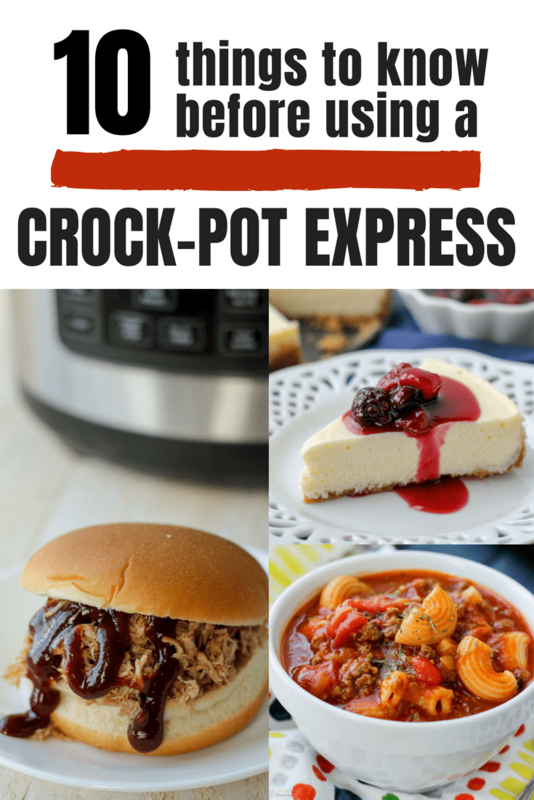 Helpful tips for getting the most out of your new Crockpot Express Multi-Cooker! So, you did it. You took the plunge and finally got yourself a pressure cooker! Now comes the part when you open the box, take one look at all the buttons and panic just a little. 🙂 I remember feeling a bit lost when I got my Crockpot Express, and all the information I could find was for the Instant Pot. Now I have a very active Facebook group called Crockpot Express Community, and I polled the group to collect what I hope will be the most helpful information for someone just starting out with the CPE! One of the primary differences between the popular Instant Pot and the newer Crockpot Express is that the latter does not have a button for manually entering the cook time. Instead, you simply choose the preset that defaults to a time closest to what you’re wanting. You can download a printable PDF Crockpot Express Cooking Guide here! So for example, if you want to pressure cook something for 10 minutes, choose the Steam button. All of the pressure cooking buttons operate in the same way. They just have different minimum and maximum times and default pressure settings. Currently, the only exception to that is CPE machines manufactured for overseas. For some reason, the newer UK machines have a manual button instead of the multigrain button. Perhaps that means that they will eventually change the buttons for the US as well? UPDATE: as of October 2018, the newly released 8 quart and 4 quart models DO have a manual button. The original 6 quart still does not, but I have a feeling it won’t be long before they release an updated 6 quart model with the same functions as the XL. Personally, I use the Steam button for almost everything. Beans/Chili seems to be another favorite starting point. So far, the only preset I’ve used without adjusting anything is Rice. Once you get familiar with your Crockpot Express, you’ll be confident with choosing settings and cook time. I was so excited to try out my Crockpot Express when I first opened the box. I found a recipe, put in my ingredients, and then stared for a while trying to figure out how to adjust the time. Once I realized you have to choose a button first and THEN adjust the time, I closed the steam release valve, hit Start/Stop and was on my way! About 10 minutes later, I was freaking out because there was steam coming out the top and it was making all sorts of sputtering noises. I immediately started searching Facebook for a support group where I could share a video and ask “is this normal?! ?” You hear horror stories about pressure cookers and I was sure I was going to blow up my kitchen. Fortunately, I did not blow up. It’s normal. When the Instant Pot first came out, I kept seeing videos on Facebook with things like “3 minutes later…” and completely cooked pasta dishes being scooped out. Or “chicken breast in 5 minutes!” and I just couldn’t wrap my head around how that would work! When I got my Crockpot Express, I realized that none of those recipes were including the warming up time as the pot comes to pressure. In general, it takes about 10 minutes for the cooking cycle to begin once the pressure is reached. That whole time, the food inside is cooking, so you need to plan for that as well as any pressure release time when venturing out on your own without a recipe. 🙂 I created a cheat sheet for cooking times that you can read about and download here. It seems crazy, but yes, you can cook food that’s frozen solid! One thing you do need to be aware of, however, is that it will take longer to come to pressure when the food inside is cold or frozen. The cook time doesn’t really need to be adjusted, though. The extra time warming up begins the cooking process early, so overall, the time is the same. For really thick cuts of meat, I have had to add extra time, so I do factor in a couple extra minutes, but not much. That said, you really should cook freshly thawed meats as much as possible. Cooking from frozen is handy in a pinch, but you get meat that’s a bit bland and watery because there’s no good way to season meat that’s frozen solid. It works best for chicken breast that you’re also cooking into a soup of some kind. I have done it with my Chicken Fiesta Soup! Once you choose your time and hit Start/Stop, you’re locked into that cooking time. The only way to adjust the time is to hit Start/Stop again, which stops the cycle. Then you can choose a new button and adjust the time from there. I like to err on the side of underdone, rather than overcooked. You can easily release the pressure, open the lid and check to see if it’s done. If you need additional cook time, just seal it back up and start the process again. The nice thing is that the pot and food are already hot, so it doesn’t take long at all for it to warm back up and come to pressure again. 6. NPR, QPR or QR, PIP, CPE, IP…ABC???? NPR-Natural Pressure Release. It simply means after the cooking cycle is complete, let the CPE naturally release pressure through the bobber valve. This starts automatically as soon as it’s done cooking. The unit will gradually cool down on its own. Wait about 10 minutes after cooking has completed, and then, using a kitchen utensil, flick the tab on the steam release valve to the “Release” position. The pressure has been released when steam is no longer escaping from the valve and the lid opens freely with minimal force. Only then is it safe to remove the lid and serve food. 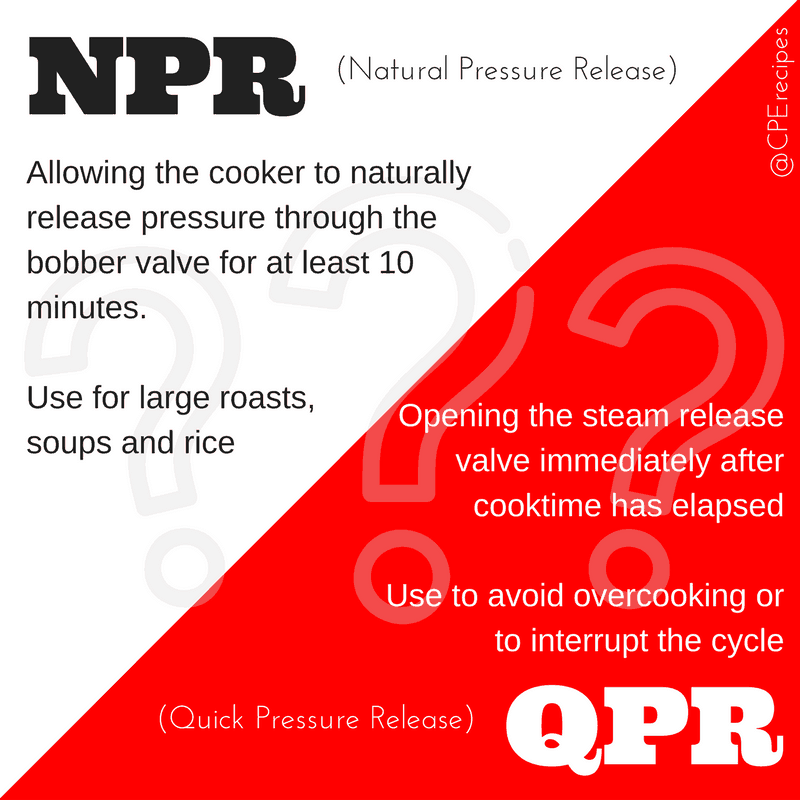 QPR-Quick Pressure Release (sometimes called Quick Release) Using a kitchen utensil, flick the tab on the steam release valve to the “Release” setting immediately after the cooking cycle finishes. Steam will release rapidly from the steam release valve. Never use this method when cooking liquid ingredients such as casseroles, stocks and soups. Never use this method when cooking rice, as rice tends to be very delicate. The pressure has been released when steam is no longer escaping from the valve and the lid opens freely with minimal force. PIP-Pot in pot method of cooking allows food to cook in a separate bowl that’s placed on a steam rack in the Crockpot Express. Steam generated from liquid below the steam rack is used to build pressure and cook the food. Any dish that is oven safe and fits inside without touching the walls or hindering the lid from locking will work! This is perfect for desserts, cooking multiple things at once, and recipe that don’t require liquid. 7. Yes, the Steam Release Valve really is supposed to be that loose. It seems wrong, but the Steam Release Valve is supposed to stay lose and move around freely. It will switch back and forth easily and “settle” into the slot when you flip it to closed. You do need to wiggle it a bit to feel that it’s all the way in position. If not, steam will start releasing as the pot comes tries to come to pressure. Eventually it will burn off the liquid inside and you’ll get an E6 error code. I would say that 85% of the E6 codes people ask about are because the valve was either left all the way open or not closed properly. Read more about E6 error codes here. One of the reasons you don’t want to do a quick pressure release while cooking soups, stews or starchy things like rice is because you can get food particles blasted up into the valve. Then the next time you try to cook, it won’t close properly and you’ll keep getting E6 messages or it just won’t come to pressure at all. If that happens, be sure to clean it carefully and run some water and vinegar through to clear it out. Unlike old stove-top pressure cookers, you don’t need to obsess over whether the Bobber Valve is up or down. It will pop into place when the pot reaches pressure and that’s what locks the lid. After the cooking cycle is over, steam will start releasing naturally, and after about 10 minutes you’ll hear a tiny “click” when the valve drops back down. This releases the lid so you can open it again! Don’t try to stick your eye in the hole to see if it’s going up or down. 🙂 Just trust the process. However, food particles can also get stuck up there and will mess things up, so if you’re having difficulty, try cleaning it out with a small tool. For starters, the condensation cup slides on. I spent a ridiculous amount of time figuring that one out. Don’t pull down to try to pop it off! Slide it away from the pot. Then just rinse it out as needed. You may be thinking-mine never has anything in it, though. Well, if you’re doing this with your lid, it WILL. When you are first starting out, it’s really nice to have a recipe that will walk you through exactly which button to push and when. That’s why I started writing exclusive Crockpot Express recipes. It’s just nice to know that the recipe you’re reading has been tested in and written for the same machine you have. However, Instant Pot kind of cornered the market at first, so the majority of recipes online are written for the IP. If Crockpot releases a new machine that includes the manual button like they have in the EU, we’ll be golden! Until then, there are just two important things to be aware of: the button you choose for the cook time will depend on how long you want to cook (see #1 in this list) and the non-stick pot instead of stainless steel means no shredding, mixing or stirring without silicone/wooden/plastic utensils! I hope this information has been helpful! I tried to cut it up into bite-sized bits so you can process and apply it easily. Pin this post to come back to it later or share it with your other CPE loving friends! Now get cooking! You can see all my Crockpot Express recipes here! Thanks so much for sharing this information with us. I have had our Crockpot express pot for a couple of months. Only been brave enough to cook hard boiled eggs. I am going to cook ribs tomorrow. Thank you. So glad I found this sight! This has answered most of my questions that I have been wondering about. Made two recipes that turned out great, so far. Gaining confidence to try more and more recipes. the tips here have made it so much easier. Love my CPE! Thank you for this information. You have answered a lot of my questions. I just received my 4 quart CPE and can’t wait to use it. Thank you, Nicole. You’re the best!